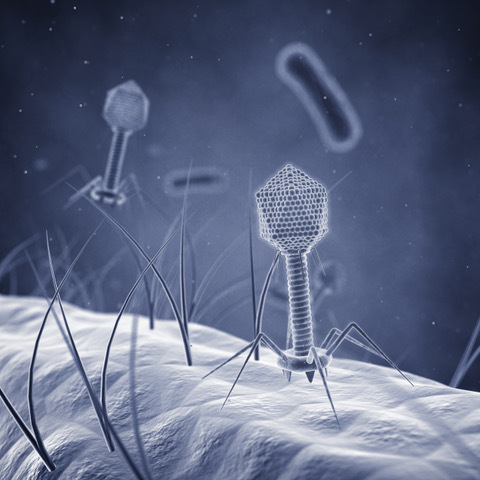 Scientists have used bacteriophage lambda (lambda phage) to reveal the molecular secrets of life since the 1950s. When you teach your students about restriction enzymes, recombinant DNA, or gene regulation, you are drawing on decades of basic molecular biology discoveries based on the lambda phage and its host, the enteric bacteria E. coli (1). As a new study from Justin Meyer’s group at UCSD shows, the lambda phage still has more to tell us about the molecular mechanisms of basic biological processes (2). The evolution of new species, which takes millions of years among multicellular organisms, can be difficult for students to conceptualize. Lambda’s small genome and fast reproductive cycle make it ideal for laboratory studies of evolution that can reveal how evolutionary diversification is driven by molecular changes that can be studied on a human time scale. The lambda phage uses proteins on the surface of the bacterial cell to recognize and attach to its host, and relies on the cellular machinery of E. coli to reproduce. The J protein on lambda’s tail binds to the LamB protein on the surface of E. coli like a molecular lock and key before lambda injects its genome into the host cytoplasm. Previous molecular evolution experiments have shown that lambda can evolve to infect E. coli variants with reduced expression of LamB through a small number of mutations in the J protein. These mutations change the structure of the J protein, allowing it to interact with OmpF, a different E. coli surface protein (3). When exposed to a mixed population of E. coli, some expressing OmpF only and some expressing LamB only, a lambda “generalist” lineage that can attach to LamB or OmpF undergoes sympatric evolution into reproductively isolated lineages specialized for either OmpF or LamB binding (4). Sympatric evolution is the phenomenon of one lineage diverging into two within a common environment, and is distinguished from allopatric evolution, which occurs when two lineages diverge after being geographically separated. The most recent study explores the mechanism of generalist and specialist adaptations (2). Mutations in the generalist population that destabilize the phage’s structure make it more susceptible to heat denaturation, but also give it the flexibility to bind to either OmpF or LamB. When lambda lineages specialized for OmpF or LamB binding emerge from the generalist population, the specialization is accompanied by an increase in thermostability. This suggests that structural instability of phage proteins allows flexibility in selecting and infecting the host while structural stability restricts its range of targets. This is a compelling demonstration of evolution in the lab where scientists can trace phenotypic and ecological changes to specific genetic mutations. 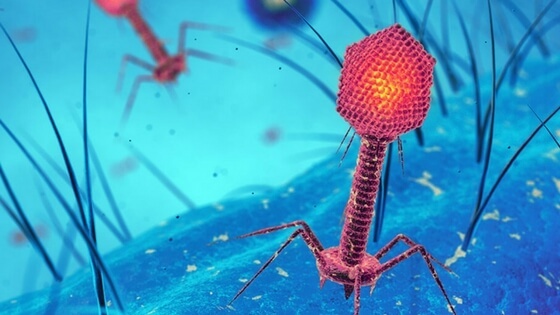 These results suggest a possible molecular mechanism whereby phages and viruses can make the jump between host species. News of influenza viruses transferred from birds and pigs to humans highlight the importance of this research for public health. Lambda phage remains one of the most accessible and informative model systems available to researchers due to the wealth of information about its biology and the established laboratory protocols. 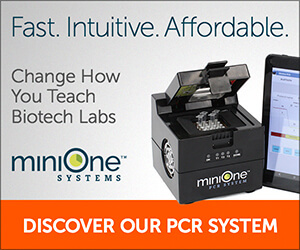 You can bring the lambda phage into your classroom with the MiniOne System’s PCR 101: Amplification from the Lambda Phage Genome MiniLab (Cat #M001). Share the history of discovery with your students then get hands-on with PCR and gel electrophoresis. Let the lambda phage inspire a new generation of inquiry and experimentation. (1) NE Murray, A Gann. What has the lambda phage ever done for us? Current Biology 17: R305-R312. (2) KL Petrie, et. al. Destabilizing mutations encode nongenetic variation that drives evolutionary innovation. Science 359: 1542-1545. (3) JR Meyer, et. al. Repeatability and contingency in the evolution of a key innovation in phage lambda. Science 335: 428–432. (4) JR Meyer, et. al. Ecological speciation of bacteriophage lambda in allopatry and sympatry. Science 354: 1301-1304.